Looking for the easiest & efficient way to integrate USPS with WooCommerce shopping cart? Tired of copying and pasting order details just to create a label? Here is the solution! ELEX WooCommerce USPS Shipping Plugin with Print Label is a WordPress / WooCommerce extension that helps you to automate USPS shipping by displaying shipping rates in cart/checkout page, print labels from within WooCommerce, pack items automatically into boxes and enable tracking. ELEXtensions is now recognized as USPS eVS Electronic Verification System Pre-certified Vendor. Step 1: Install the Plugin, input your USPS Account details and enable USPS Shipping Method for WooCommerce. Step 2: Customer sees USPS shipping rates based on items in their cart before placing an order. 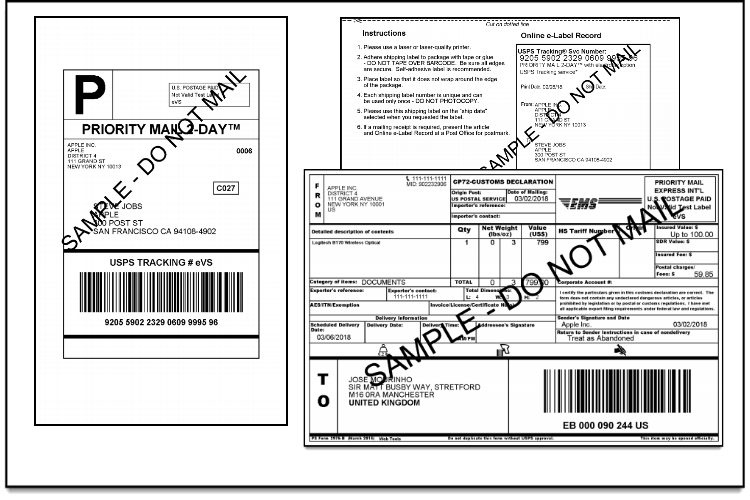 Step 3: Print USPS eVS Label with postage and Generate Tracking info from within WooCommerce order page. If you don’t have USPS eVS account, then our Stamps.com USPS Plugin will be the best choice for you to print the USPS labels. 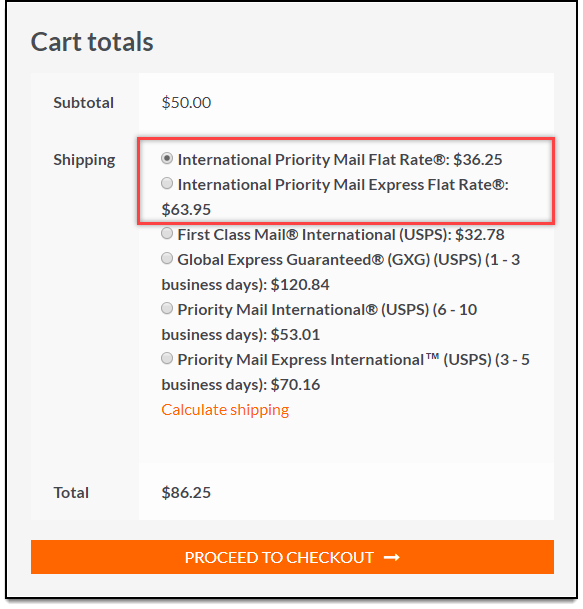 Based on the product weight, box dimensions, shipping destination etc., the plugin fetches USPS postage rates for both domestic and international shipping services. You can choose to return list rates or account/negotiated rates. If you are USPS e-VS customer, print shipping labels with Postage (using USPS eVS APIs) from within WooCommerce. The USPS eVS API is designed for very high-volume package mailers. e-VS, or Electronic Verification System, can be integrated directly through USPS, unlike most other USPS options which require a USPS Provider. In addition to this, you can even create eVS shipments in bulk, in the WooCommerce Orders page. If you don't have USPS eVS Account, then we recommend using ELEX Stamps.com USPS Plugin for printing USPS Labels. If you are shipping dangerous products across the borders, shipped through air carriers or air freights, you should attach an eVS SCAN Form to the goods. This form is useful for Customs clearance for alcohol, toxic products, flammable products, and so on. You can create SCAN Forms using Order ID or Date of Lable generation, in the USPS SCAN Form dashboard. The tracking number returned from USPS while generating the label would be added to order notes and will be sent as part of the order completion email. This enables Shipment Tracking for customers and shop owners. Flat Rate Boxes cost you a fixed price as long as the parcel weighs less than 70 lbs. The boxes come in multiple sizes which makes them suitable for products of different sizes and weights. These are easily available and are economical packing materials. I’ve had this plugin for around 6 months and I absolutely love it. The support is way above average…it’s stellar. Lorenzo answers all of my questions by the following morning (we are in different time zones). This USPS plugin really does work as well as it says. So so so much better than the free one in Woocommerce. Plugin has been great so far, and Lorenzo gave me super awesome support, even when I really didn’t need it. It was simple setting issue that I had overlooked. My client needed a pretty robust shipping solution, and this plugin does everything they need. During initial testing, I couldn’t get the rates to fire. I then looked at the free plugin repository on WP, and they had already set up an FAQ regarding this issue: I just needed to enable “bug logging” and run a test order. Bam. Fixed. I highly recommend this plugin. Works great. Great product and even better customer service. They wrote a custom code snippet for me to make this plugin work exactly as I needed. Can we print Flat rate box shipping label with this plugin? With the USPS plugin, you cannot print the label for flat rate boxes but you can use our ELEX Stamps.com Shipping Plugin with USPS Postage for WooCommerce. Can we restrict Media mail only to certain shipping class? Yes, you can do so in the plugin settings under the General tab at the bottom. Enter the shipping class name for which you want media mail to show up. Can I add an additional fee to Flat rate box shipping cost? Yes. Under the Rates and Services tab, you can add the flat rate fee. It will add the cost to the actual flat rate boxes price. Can I use the plugin in a Multi-vendor environment? Right now our plugin does not support Multi-vendor environment. But we do have a plan to make it compatible in the future. Can I offer Free shipping using the plugin? 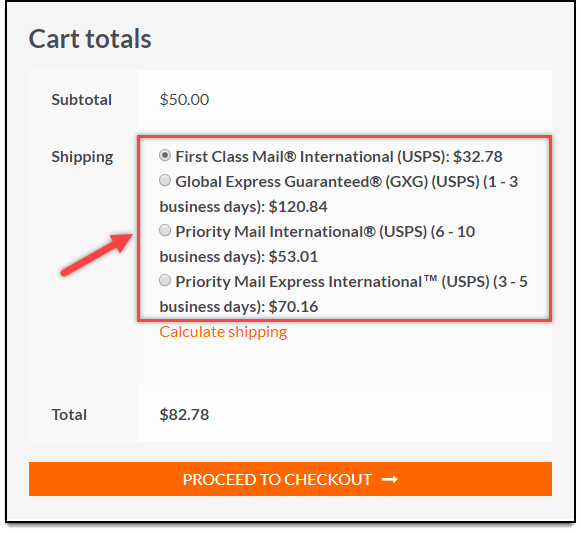 The plugin can only calculate the shipping cost based on the package details and the destination address. However, If you want free shipping, you can add that in WooCommerce Shipping zones. Can I print Order manifest using this plugin? Yes, you can. Under the WooCommerce menu, you’ll get the option to print the Manifest, based on date or order IDs. 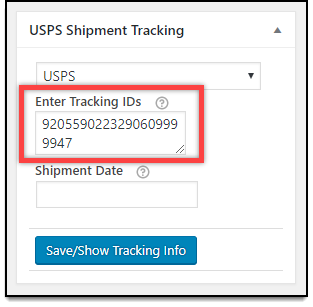 Can I display the tracking information in the order details? Yes, the tracking information will be displayed in the order details on customer’s end as well as the admin end, once you create the shipment. What all the formats the plugin supports for Shipment Labels? The plugin supports PDF & TIF format. Does the plugin work fine with other shipping plugins? Yes, the plugin works fine with other shipping options. It will just show additional USPS option along with the other shipping options from the other plugins. Can I print labels and pay for the postage in the postal office? The non-postage labels for USPS have been stopped by USPS since Feb 2018. So you only have the option to print labels using the Click N’ Ship Business pro account with eVS integration. Can I use the plugin just to offer live shipping rates without having the USPS account? Yes, you can leave the username field blank in the plugin settings. But make sure you have weight and dimension in the products. Also, if you just want to get the live shipping rates, the process to get the WebToolsID is pretty easy once you register with USPS. Do you have tracking for International orders? Most USPS services don’t have international tracking since USPS function only within the USA. When the packages go international, they transfer the services to new carriers. I am not eligible for an eVS account. Can I still use this plugin? If you are not eligible for eVS account, you can still use this plugin for displaying real-time USPS shipping rates on cart/checkout page. For label printing, we recommend you to check our ELEX Stamps.com Shipping Plugin with USPS Postage for WooCommerce. Is there Insurance option in this plugin? Right now the plugin does not have the insurance option since most shipment with USPS is insured up to a certain value, but we’ll surely add this feature in the future. Purchased another plugin by mistake and asked them to swap it on similar one by price. They did it without any complaints or questions, within 1 business day as it said on their website!! Good support and quick responce!! For me, it’s working quite stable, then you have it configured to your liking and your prices, it’s just to let it work. I have had some details that the support has always given me an excellent solution, thank you very much !! Lorenzo is the greatest!! prompt, no nonsense, effective support! Keep getting errors, cant print postage and overall super unhappy with the documentation on how to get this to work. This has the illusion that it is your all in one shipping needs yet it doesn’t really do the final thing i needed… waste of 69.00 did not get the first order for shipping till now which is why i am not happy now. If I would have known I would have never purchased this. I purchase the plugin and to be honest at the beginning I was going crazy, Lorenzo was very helpful in explaining everything to me how to make work and provided some hint. I was able to get it started the way I wanted. Excellent customer service support. Thank you Lorenzo. Went ahead and purchased the premium product of this and Lorenzo provided some support at the beginning. However, when the plugin was not properly functioning with our site. Since then, I’ve sent multiple requests for help and at this point asked for a refund. However, no response. Hmmm…I even asked politely if I could possibly exchange this plugin for the EasyPost plugin, and again, no response. Great product AND great support. They logged into our site and installed a code snippet to sort and display the shipping prices in the cart from low-to-high and we love it. Great Product, and even better – Great Service. In my attempts to avoid paying full-price for this premium product for my Woocommerce store, I first purchased another company’s knock-off version for around $20. I got what I paid for in that one–a crappy plugin that didn’t work and customer service was extremely hard to contact. I ended up getting a refund for that crappy $20 plugin and immediately bought this one. I’m so happy I did–it works beautifully. I had a hard time getting all my shipping options to work properly in my store (because I didn’t entirely understand what I was doing), so I contacted the customer service for this plugin (which was extremely easy) and he resolved my issue within 2 days. He logged into my site and did his magic. Now all the shipping options I wanted offered at checkout are up and running. You really do get what you pay for, folks. Don’t cheap out. Invest in this quality plugin. Great! Plugin performs as described, and we got quick support on an issue. Really did the job for me. This product has been everything I’ve needed. It’s both flexible and easy to figure out. When I’ve run into an issue that needed to be resolved, the customer service by Xadapter has been fast and helpful. I highly recommend this product! I use it on multiple websites. Truly an exceptional product. Works beautifully, and has many different options and configurations, all easy to use and well labeled/documented. What really makes this plugin amazing is the incredible service. I am a repeat buyer, and any time I have ever contacted them with questions, they respond right away, and are kind, helpful, and get the problem solved or my questions answered in record time. I am very happy with this company and will continue to use them in future projects. My client purchased this app on yesterday for her website. As of today support has been quick to respond. It has been a wonderful experience. I am looking forward to integrating the plugin today on http://www.ilovehealthyme.com. Very happy with this plugin. It works as described and when I had a few glitches the tech support responded quickly and with the right solution. Thank you! Customer service is the best I have seen! I This plug is worth the money! But if I could tip the customer service guys every time they QUICKLY resolve any issue I think I would happily go broke. This plugin works perfectly for me. I had a few problems that were my fault but the very helpful people at Xadapter were very patient with me and helped me figure it out quickly. I just needed to weigh my products very accurately and account for the weight of my packaging too. Plugin works great, not difficult to implement and customer service is prompt with replies to inquiries. I had an issue with shipping dimensions. I knew only 4 of one of my items would fit in a medium flat rate box when adding packing material, but the plugin would allow for 6 to go in the same box. The rep I spoke to gave me the idea of taking the cubic inches of the box, dividing it by 4 since 4 items fit in it, and getting the cubed root of that number which then gave me the LxWxH to use in the item dimensions. Other than that everything about the app works great. Thank you. Very effective help. Their online chatting is very helpful and they can fix your error within no time. strongly recommended! Once I submitted it to support I was contacted immediately. I gave them access admin access and the issue was fix right away. I’m writing this review, from the point of view I’m not tech at all so…. when I purchased this for my WordPress eStore, I asked a lot of time to the customer support, and they explained to me everything very easy step by step, but I was lost, so I asked a lot more time to the customer support, and they were for me all the time, they also access my store to help configure it, so I’m very happy with the results of my purchase and very very very very happy with the customer support. This is a great plugin. When we had a minor issue after a month of using this plugin, tech support immediately responded and fixed the problem within an hour. Outstanding customer service, thank you! This is an incredible plugin and comes with AMAZING customer service! I really appreciate the help! I had a problem and it was solved practically IMMEDIATELY!!! Plugin works like a charm, had some questions about install and setup received quick responses each time, can’t beat that! Excellent customer support. Main concern when buying these plugins is what if something doesn’t work or go wrong. But their customer support helped so much. There are lots of options available with this plugin; more than I can figure out how to use. I was having problems getting the plugin to calculate shipping so I contacted them. I gave temporary admin access to woo force when they gave me their email address. Vj fixed the problem quickly and told me what the problem had been. Overnight. Plug in works perfectly! Had some questions after initial purchase and install. Author got back to me within 24 hours on two occasions. Got my questions answered. Highly recommended. (3) printing the USPS labels for domestic shipping and international shipping. I originally I gave it 4 stars because it did not offer ability to print the label for USPS International First Class Package service. But WooForce was quick to respond and added the feature I needed. So this is definitely a 5 star plugin all around! (3) printing the USPS labels for domestic shipping. I gave it 4 stars because it currently does not offer ability to print the label for USPS International First Class Package service. As soon as they add that feature, then I will up it to 5 stars. If you only ship domestic USA then this is a 5 star plugin!